← Plundering Antique Shops From Ohio to Montana – and Back! I scour flea markets and shops for many things, but I’m always drawn to vintage photos. I look for unique images of all eras, but I particularly like photos that tell a story of some sort, photos of children with their toys, holiday photos, and amusement park/tourist attraction photos. The main prerequisite is that they be cheap. I rarely pay over $5 for a photo; I’m thrilled when I find snapshots for a quarter and fifty cents. This trip did not yield as many photos as I wish it had, but I’m sure Jim would say that I found enough. Here are some of my favorites. These two snapshots were found in the same bowl and were priced at a quarter each. I suspect they came from the same family and possibly the same trip. I love the guy standing next to the giant ox/long horn steer. We found several giant tourist attraction statues on this trip, particularly in North Dakota, so I could relate to this snapshot. 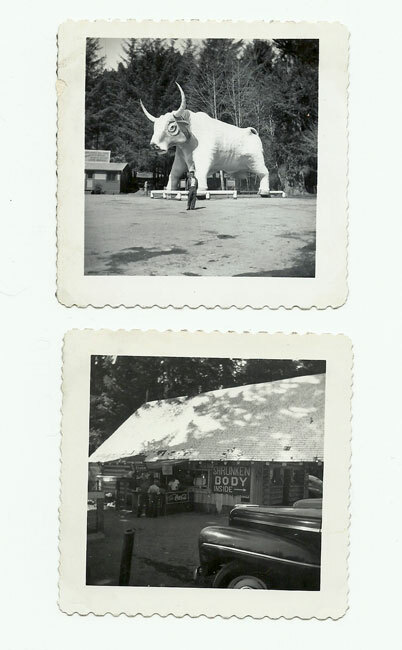 The second photo shows some sort of cheesy tourist trap. I wonder what the shrunken body inside the building looked like? Was it a real deal or some fake thing? I also love the old Coca-Cola sign. I like family snapshots if they tell a story. Both of these fit the bill. 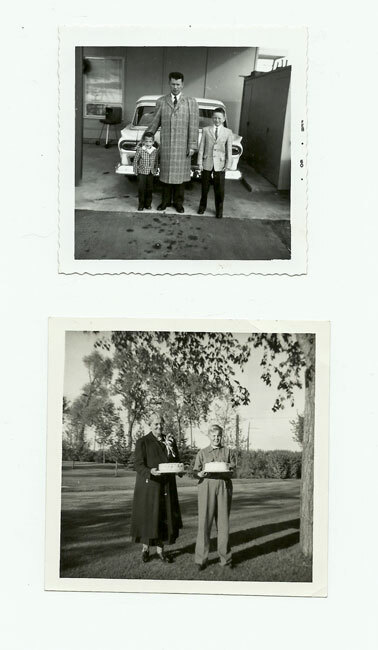 The top photo of the dad and his two sons is dated 1960 and appears to have been taken on Easter. Everyone is very nattily dressed, especially Dad. You have to wonder if he was ever seen in public again wearing that coat. The second photo is a genre that I have several examples of – people holding birthday cakes. I’m wondering why there are two cakes here. It must have been a big party. I like the look of pride on both the boy and the grandmother. 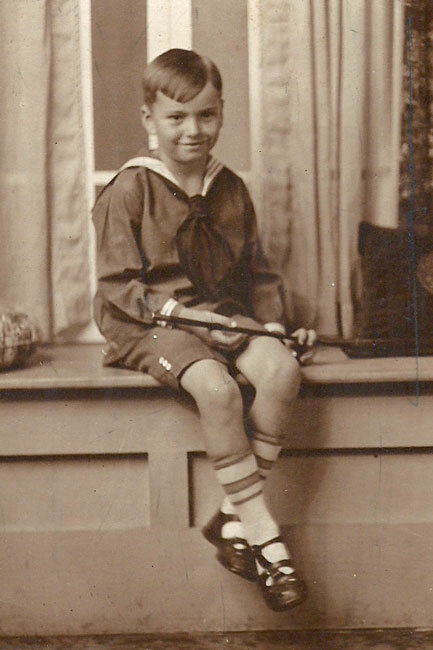 This little boy looks happy enough to be dressed in his sailor suit and Mary Jane shoes, but he sure wouldn’t survive a minute in today’s world. This is a real photo postcard with no identification whatsoever. 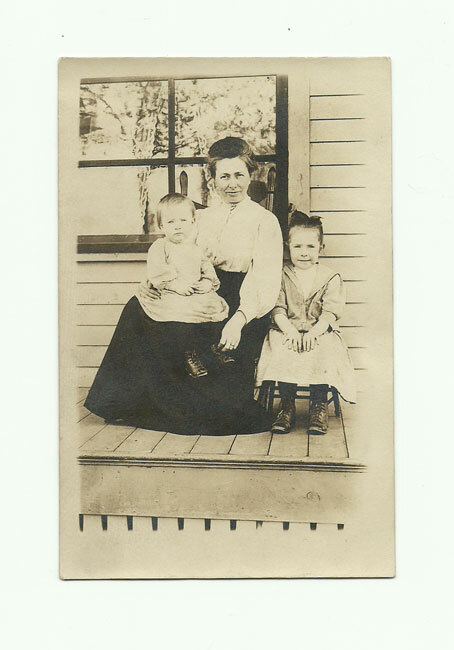 It’s a beautiful family portrait from the early 1900’s. You can’t help but wonder how life turned out for this family. The little girl is so sweet and serious about posing nicely for the photographer. This is a large sepia photo that measures 7 1/2 by 9 1/2 inches. It was found in a shop in Helena, MT priced at $3. It was taken by a photographer from North Columbia, California. 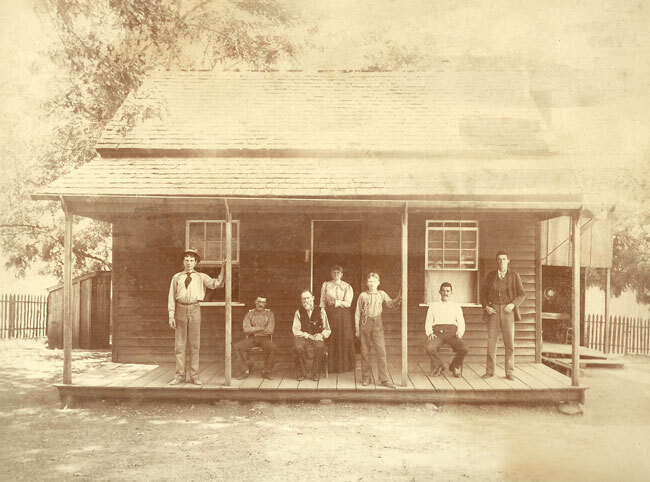 North Columbia was a gold rush town in the Sierra Nevadas. This photo probably dates to the 1880’s. The house looks sturdy and somewhat prosperous. I suspect the three people in the center are a married couple and their young son. I wonder if the young man on the left is their other son. The other three gentlemen could be relations or workers who board with them. Clearly, everyone is dressed in his/her finest clothes and there are several pocket watches and/or fobs on display. If only photos could talk, what stories could they tell? 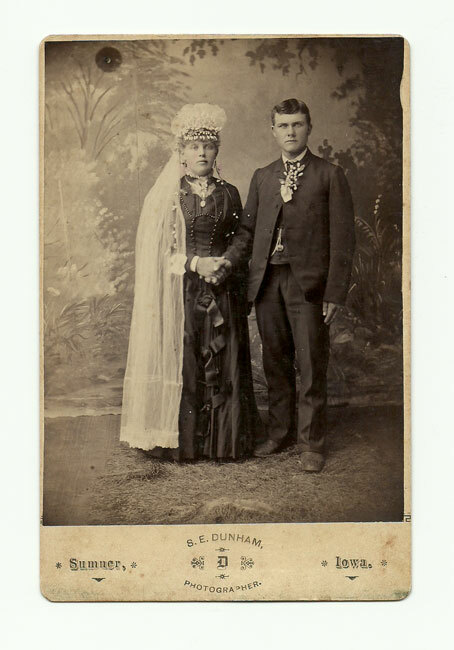 This wedding photo from Sumner, Iowa was found in a shop in Montana. Having been to Iowa and knowing that Iowa was settled by immigrants from European countries like Norway and Czechoslovakia, I was intrigued by the bride’s elaborate wedding veil, clearly an indication of her ethnic origin. Unfortunately, I don’t know what that is. To me, the photo is a visual reminder of the many people who came to the United States looking for a better life, with marriage being the real starting point for a family. Last, but not least, here is the photo that I can most relate to. I call it “The Barbie Girls.” These young ladies are probably about two years younger than me because they are posing with their new bubble-cut Barbie dolls. 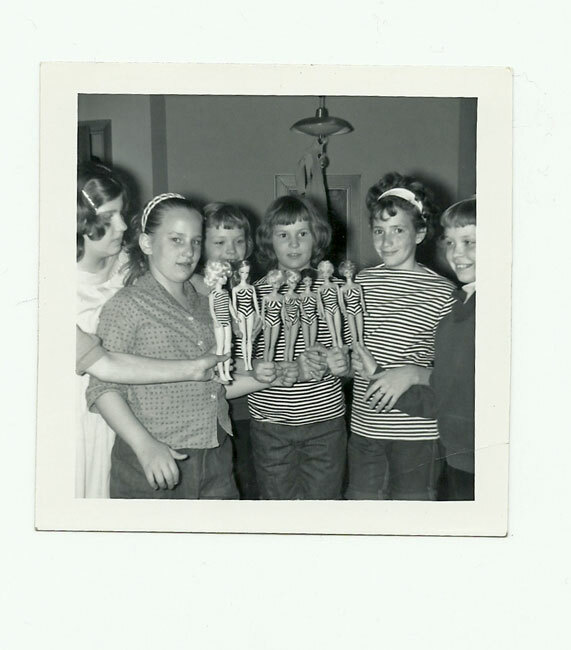 I never got to that point with my Barbie “collection.” I had one and only one doll, and she was a ponytail version. The bubble-cuts came out in 1961, so I believe this photo dates to about that time or possibly 1962. Note that a couple of the girls even have shirts that match Barbie’s black and white striped bathing suit. Also note that one poor girl who doesn’t even show in the photo is holding a fake Barbie! My heart goes out to her. This little snapshot was one of my favorite finds at the gigantic Gold Rush Days Flea Market in Oronoco, MN. This entry was posted in 1800's, 1900's, 1920's, 1940's, 1950's, 1960's, Carol, Photography. Bookmark the permalink. Great entry to kick off your road trip finds! I especially love the photo of the father with his two sons. It’s incredible. I find your comments about the little boy wearing the sailor suit and maryjane shoes quite amusing. Here in the UK, back in the Nineteen Sixties, and early Nineteen Seventies it would have been quite common to see little boys wearing short trousers and t bar sandles. Toddlers irrespective of gender also wore light cream or white single buckle shoes at the time with white ankle socks, and shortals/ rompers. I remember one of my friend’s having a little brother when I was six, and who was dressed like this. I vagually remember as a little boy aged around three, dressed in some blue t bar sandles, white ankle socks, and short trousers, in the late Nineteen Sixties. I do feel it is a sad indictment that marketing has created such a strong gender distinction in even young children’s clothing and footwear. It does amaze me how much negative comment is directed at mums on the American Bog Sites, who dare to dress little boys in traditional clothing and footwear. I have not come across this type of criticism from similar UK Blog Sites. This even extends to how George is dressed. But I really feel this suggests perhaps a lack of taste and sense of tradition among Americans, compared to people in Europe, and the Uk. . If you look at more recent photo’s of the Royal Family you will also see Royal Children dressed traditionally, and wearing t bar or single buckle shoes.